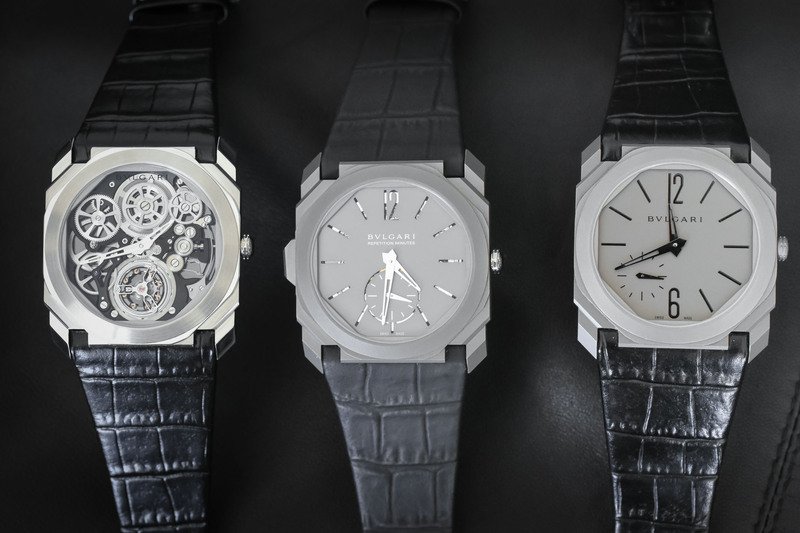 A trilogy of metals for the ultra-thin luxury sports watch. 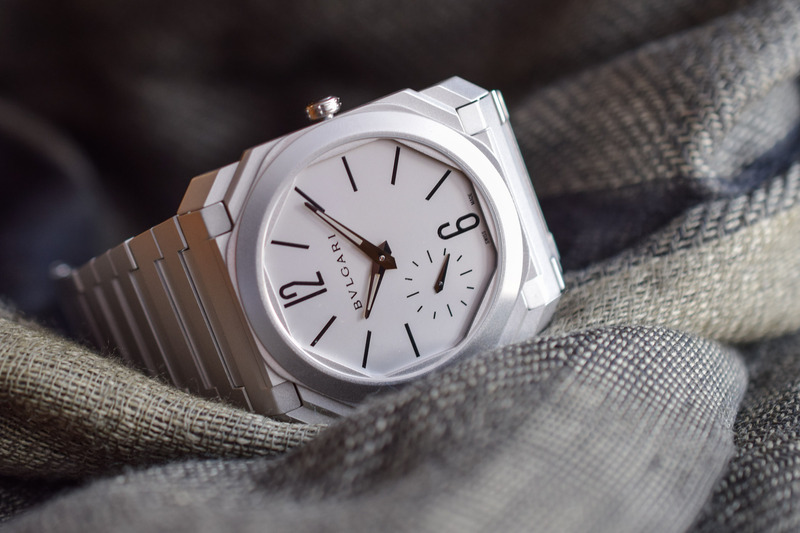 Exactly a year ago, Bvlgari stunned the watchmaking world by launching what was then the thinnest automatic watch on the market, the Octo Finissimo Automatic. The best thing about this watch was that it had nothing to do with a shy, demure timepiece. 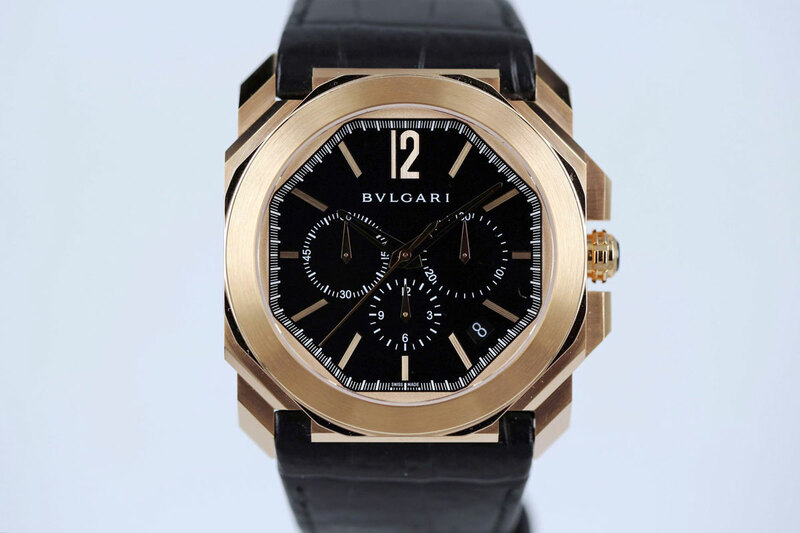 Instead, Bvlgari came out with what we think is a true example of a luxury sports watch (see it face to face with the mother of them all, the RO). 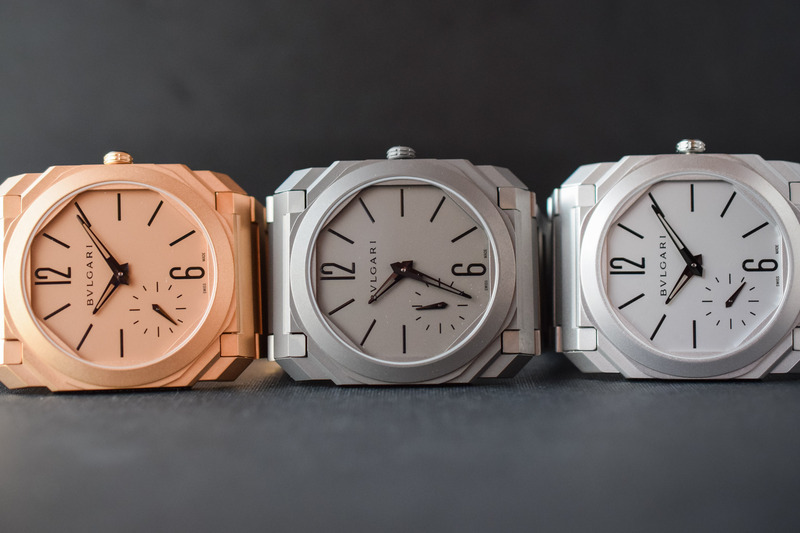 For Baselworld 2018, what was a single watch becomes a trilogy and a fully-fledged collection, with the introduction of the Bvlgari Octo Finissimo Automatic Sandblasted in steel and 18k rose gold. Impressive. This is the word that first came to mind when we discovered the Octo Finissimo Automatic at Baselworld 2017. Not only in terms of mechanics. Not only in terms of styling. The mix of the two was an utterly impressive performance. 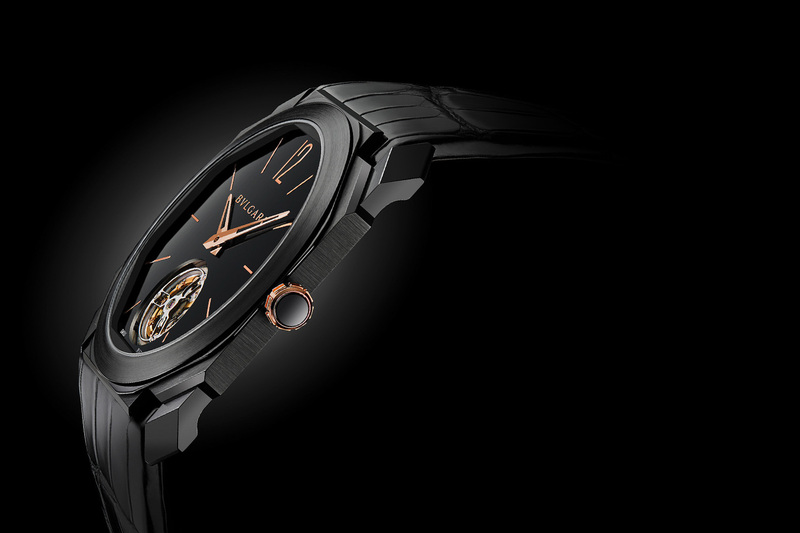 Bvlgari already had the thinnest tourbillon and the thinnest minute repeater on the market. 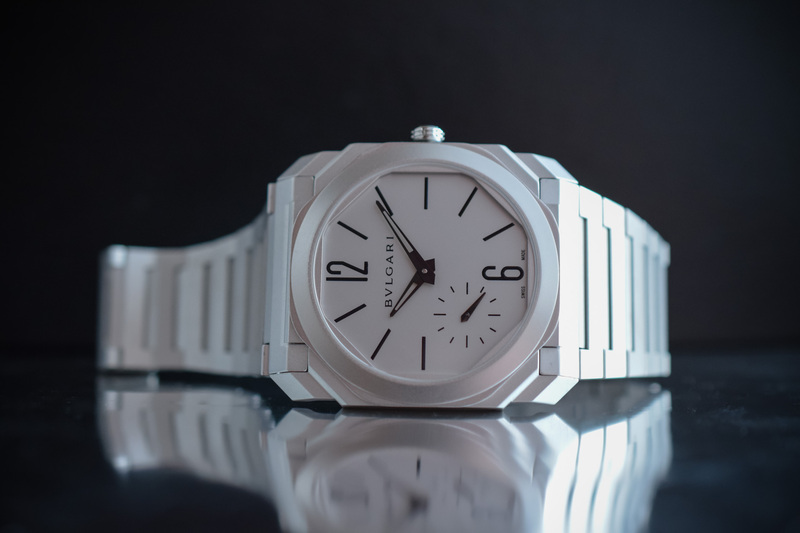 Then it launched the world’s thinnest automatic movement, placing it one step above the master of ultra-thin: Piaget. Yes, in the meantime, Piaget has reasserted its position with the thinnest automatic watch – the Altiplano Ultimate Automatic – and with the thinnest watch ever – the Altiplano Ultimate Concept – but Bvlgari’s performance remains memorable, mainly because of the watch that is fashioned around the movement and because of the traditional construction used by the Roman brand. 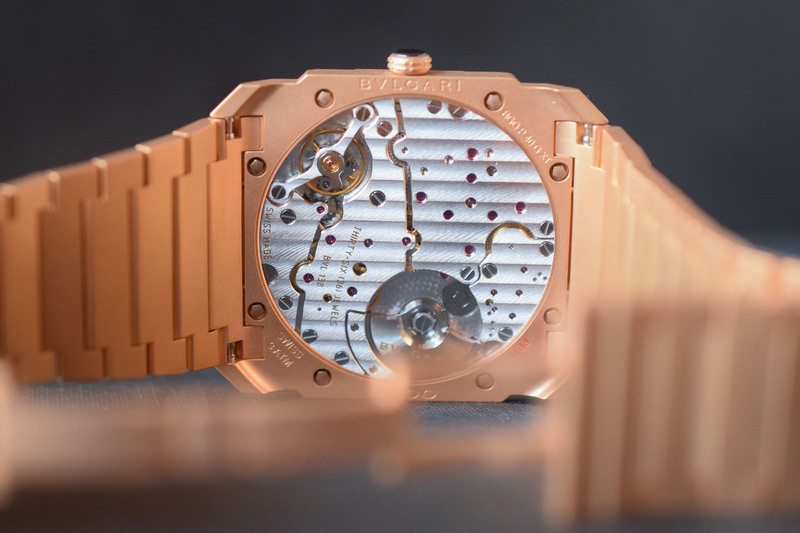 While Piaget cleverly uses tricks such as the case back doubling up as the main plate of the movement, the Octo Finissimo Automatic remained extremely traditional with a standard case, a see-through case back, a simple dial, and a movement that was a stand-alone part of the watch… But the big difference was in its design and the 2.23mm thick movement was cased in the Octo, an iconic and bold shaped watch. 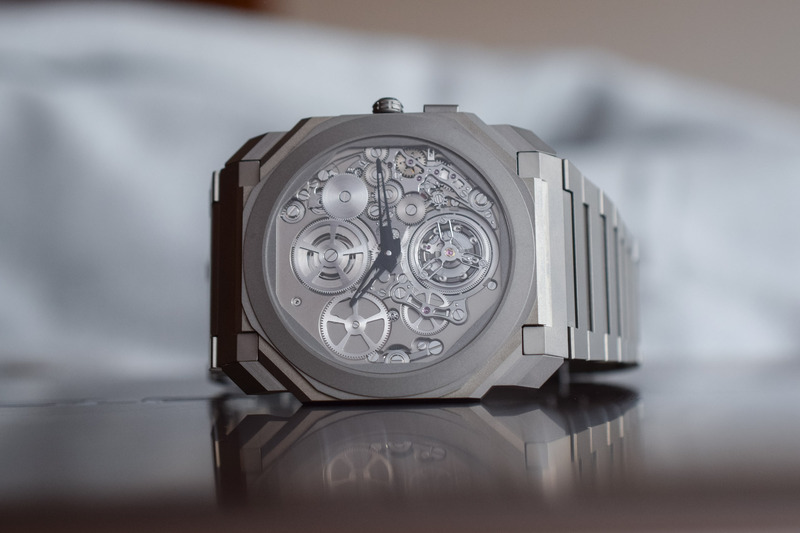 Until now, the only material possible for the Octo Finissimo Automatic was sandblasted titanium, both for the case, the dial and the optional bracelet (also available on leather). 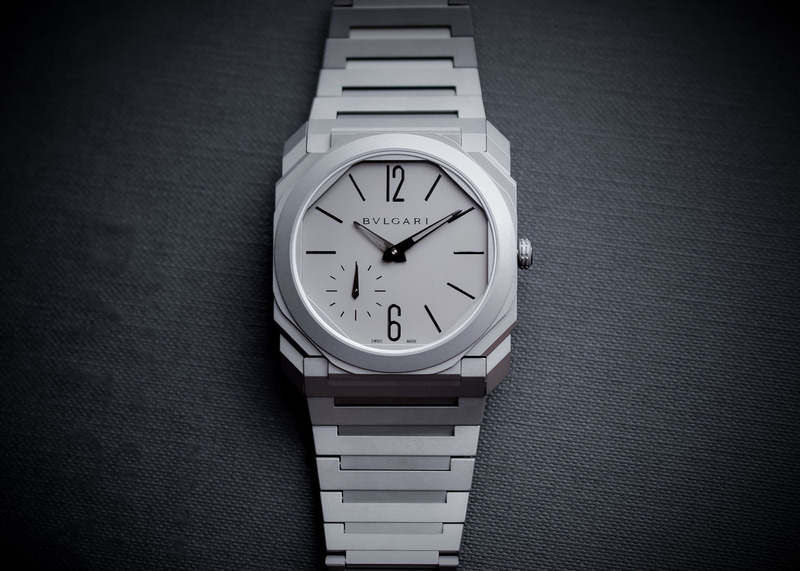 For their 2018 collection, Bvlgari has decided to increase the impact of the watch and to offer more variants to enthusiasts by introducing two new models. The Octo Finissimo Automatic will now be available in steel or in 18k pink gold – and, as you can see in the photos, the pink gold is quite a spectacular piece. While the materials are different for 2018, the concept remains the same. A fully matte finishing is applied to both the case, the bracelet and the dial creating a homogeneous surface that echoes the colour of the metal throughout. The result on the steel version is a much brighter and very metallic stealth look. It’s only when you place this new steel Octo Finissimo Automatic next to the existing titanium version that you can fully appreciate the difference in colour. (Note that the steel edition can be ordered with a steel bracelet or black alligator strap.) The other novelty, manufactured entirely in 18k pink gold, is far more expressive. 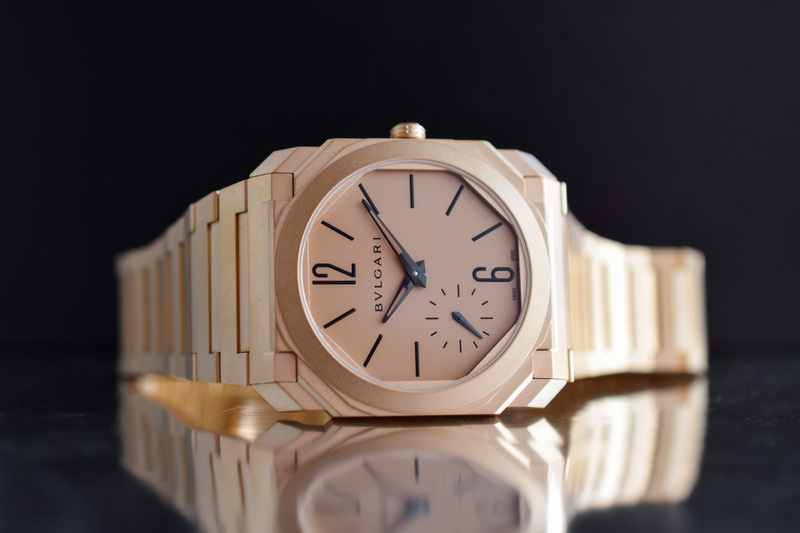 Yet, as we are in a luxury sports watch context, the use of gold is a sort of must-have – see Patek Philippe’s Nautilus or Audemars Piguet’s Royal Oak. However, since the surface is sandblasted, the effect is surprisingly different, with a silky texture, fewer reflections and less shine, and a colour that feels unprecedented. On the wrist, the change of material implies a different feel – both metals, especially gold, are heavier than titanium. If MONOCHROME praised the use of titanium for being so light and so comfortable, we are also aware that some collectors found this watch too light for their taste. Problem solved. 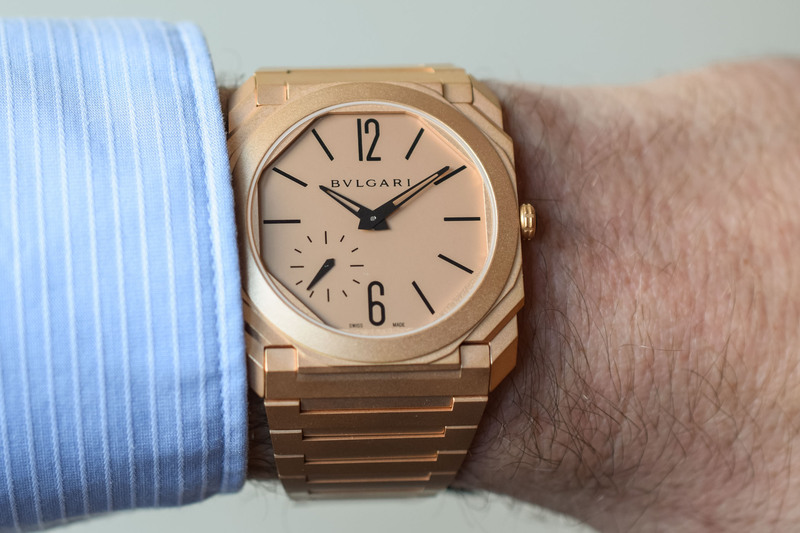 The change of material doesn’t affect the pleasure of wearing the Bvlgari Octo Finissimo Automatic… An interesting duality arises with the combination of a weighty metal and a paper-thin case creating a sensation of presence and near absence in one. Under the hood is the same micro-rotor of the ultra-thin calibre BLV138. Manufactured in-house, it is only 2.23mm thick (the size of a CHF 5 coin). Even if it is extra-flat, it is a large movement, which occupies the entire case. It is decorated with thin Geneva stripes, circular graining on the main plate and bevelled angles. A modern movement overall, with a very decent 60-hour power reserve. 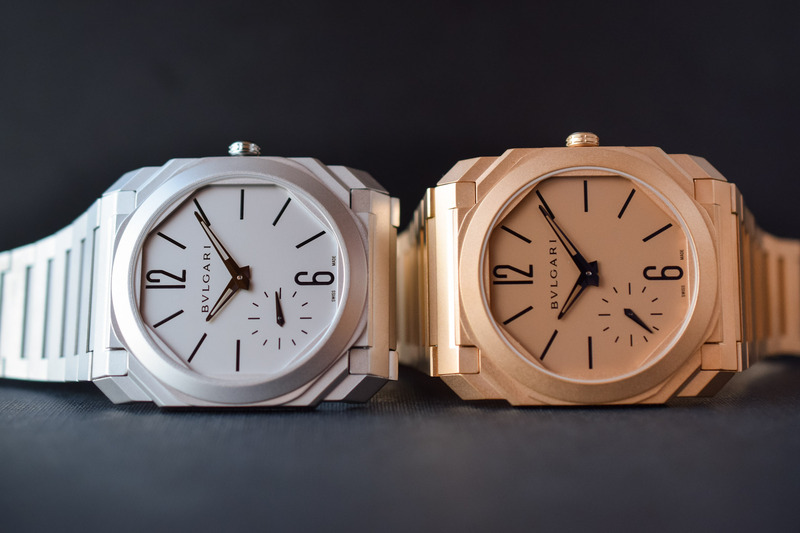 These two new steel and 18k pink gold editions of the Bvlgari Octo Finissimo Automatic are additions to the existing titanium variant. They will hit the stores in April 2018. The steel version is slightly more affordable than the titanium version and priced at EUR 11,900 on a leather strap and at EUR 12,900 on a steel bracelet (vs. EUR 13,500 for the titanium on bracelet version). The full 18k pink gold edition will be priced at EUR 44,900. More details on the official Bulgari website.